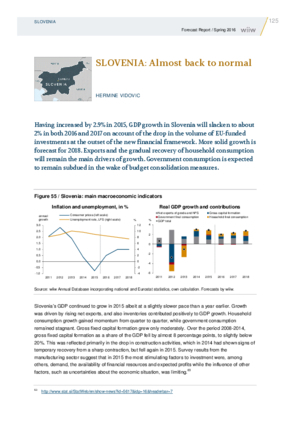 Having increased by 2.9% in 2015, GDP growth in Slovenia will slacken to about 2% in both 2016 and 2017 on account of the drop in the volume of EU-funded investments at the outset of the new financial framework. More solid growth is forecast for 2018. Exports and the gradual recovery of household consumption will remain the main drivers of growth. Government consumption is expected to remain subdued in the wake of budget consolidation measures.